Neds Australia, owned by GVC Holdings, is one of the best Australian betting sites of 2019. Belgium, Brazil, Canada, China, Czech Republic, Denmark, Dutch Antilles, France, French Guiana, French Guinea, French Polynesia, French Southern Territories, Germany, Hong Kong, Hungary, India, Indonesia, Iran, Ireland, Italy, Luxembourg, Malta, Myanmar, Netherlands, North Korea, Pakistan, Poland, Portugal, Russia, Singapore, South Africa, South Korea, Spain, Taiwan, Turkey, United Arab Emirates, United Kingdom, United States of America, US Virgin Islands, Vietnam. Neds Australia might only be a few years old, but it already has a firm foothold as one of the best betting sites down under. This Neds.com.au Review will give you a comprehensive overview of the operations of Neds.com.au plus its betting and racing products. Founded by former Ladbrokes CEO, Dean Shannon, Neds was launched in October of 2017, just in time for that year’s Melbourne Cup. Since then, the company has already changed hands with Ladbrokes Australia’s parent company, GVC Holding, buying it for $68 million. for a $500 signup bonus or just follow any of the links on this page to have the code automatically entered. The best part about a new bookie is you can sign up and claim a betting bonus as a new punter. All you have to do is follow our links and the exclusive bonus code will be applied for you. Then, make a deposit with the available options detailed below and you can get started. You can register an account with Neds – which takes just a few minutes – and receive up to $500 in matched bets – the perfect tonic for punters on a good thing. Additionally, you will need to wager the deposit and bonus bet at least once on win only bets before making withdrawals. Always read the terms and conditions when claiming a bonus offer to see if you are eligible to claim the offer. You can also contact customer support, which we detail below. Read our detailed guides on the current Neds sign up bonus offer and Neds bonus promo codes for further information on how to successfully claim their bonuses, how to fulfil their wagering requirements and the finer print in the terms and conditions. There are a few other features you can utilise at Neds to help your bet slip go further. You can add the Bet Boost feature to your stake, for no extra cost, to increase your winnings. All you need to do is click to activate the ‘Neds Bet Boost’ via your account and then select it on your bet slip and you could see a greater return than expected. You can deactivate the feature under your account settings, too. Neds also makes it easier for punters who enjoy multis. You can build your betting slip the way you like – it’s even easy to do on your smartphone or tablet – with Neds Multi Builder. Neds features a striking orange and black theme, which is easy on the eye, and an easy to navigate layout. The available betting categories are detailed on the left hand side including Racing, Sports, and Live In Play. You will also find links to the Promotions page here and to your Account. There’s also a QuickLinks section which features popular betting markets including the Melbourne Cup. Along the top panel you will find links to the cashier, and information on pending bets and your account balance. Your bet slip is also located in the top right hand corner. Racing enthusiasts won’t be disappointed with the range of betting markets on offer at the new bookmaker. Neds offers a variety of Australian and New Zealand horse racing markets, as well as greyhound racing. The site also features a range of international horse and harness races. The racing markets are displayed in an easy to read format – click on the race of choice, and the race number to view the odds. There’s additional features which may help you place a bet including Money Tracker, Fluctuations and Featured Bets, as well as daily and weekly promotions which make your dollars go further. Below the odds is a handy guide for people new to wagering, including detailed information on what certain terms mean. There’s several sports markets available at Neds including Australian Rules, baseball, American football, boxing, cricket, cycling, golf, darts, handball, tennis, esports and much more. On the main page you will find links to sporting events which are next to go, as well as featured matches such as the Superbowl and NBA championship. Or you can click on the preferred sports category to view the available markets. Neds also has promotions available for existing members which may be emailed out. Live in-play betting is also available for a range of overseas sporting events including Major League Baseball. Call 134 777 between 7am and 11pm AEST. Neds offers a mobile app which you can download onto your smartphone or tablet. Once the icon has been installed onto your home screen you can open it up, sign up/log in and get started. There’s an app available for both iPhone/iPad and Android users. If you don’t want to download an app, you can visit the site via your mobile browser. The site has been optimised to work with most modern portable devices, including Apple, Android, Windows and other branded smartphones and tablets. Head to Neds, create an account and then place your bets on the go. You can make deposits and withdrawals on your phone as well, so you can be at the game waiting for the match to start or heading to the track in the back of a cab while placing your bets for the day. Neds offers Australians several choices when it comes to funding your betting account to settle your bet slip. The payment methods are secure and you will find some are instantaneous so you can get betting on that race which is on in just a few minutes, or the best try scorer for the game that’s about to be broadcast. Neds offers punters instant deposit methods including credit and debit cards, such as Visa and MasterCard, as well as POLi. You can also make a deposit via BPay or bank transfers but funds can take up to three days to appear in your account. The minimum deposit is $5 for most methods. Bookmaker withdrawals take a bit longer than deposits, but you can expect to see your winning in your bank or web wallet account between 24 to 72 hours depending on the method you choose – bank transfers can take the longest. You will need to verify your account before you can make a withdrawal, but Neds makes this simple. Neds is licensed in Australia and offers support in local time. You can head to the FAQs for broad questions and answers before contacting the support staff. If you still have an issue you can contact support via live chat, where a representative will aim to get back to you within 48 hours, however they’re likely to get back to you quickly within Australian daylight hours. If your issue is urgent and no one is responding you can call 1300 006 337 between 7am to 11pm. Licensed by the Northern Territory, Neds joins the likes of BetEasy and Sportsbet, offering Australian punters a range of sports and racing betting markets. Shannon worked for Ladbrokes as the CEO after the corporate bookmaker purchased his site Bookmaker.com.au for $22.5 million. When Shannon first announced he would be launching an online bookmaker, it was believed it would focus primarily on lottery betting – similarly to Lottoland, but Shannon chose to enter the competitive market by catering to a broader audience, and just in time for the Melbourne Cup. The bookmaker will also cater to punters in Britain, while giving Australians more variety when it comes to lottery betting sites with a lottery division. Neds has gained a loyal following quickly in Australia, largely through its big budget advertising campaigns and promotions. Having said this their website across all platforms is first-rate. 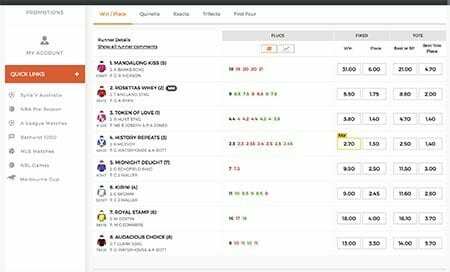 While assessing and writing our review for Neds.com.au we found competitive odds and some nice features which can increase your payouts when betting on Australian horse racing. Several technical difficulties have plagued Neds on major racing days, but they are hoping these things are in the past, heading into the second half of 2019. Australian licensed online bookmaker, Neds.com.au, has launched a cryptocurrency platform where punters can deposit, bet and withdraw with bitcoin. Back a team in the NFL Playoffs today and get a bonus bet up to $20 at Neds.